Ready To Learn Till I'm Alive! Good habits and learnings, like Charity, begin at home. My sister & I had just finished having food at a wedding celebration feast, when some of our relatives came near our table with their kids. My cousin’s husband showed his kids our plates and asked them to observe carefully. “I want you to emulate these two Mausis (Aunts)…See, how there’s not even a grain of rice left on their plates after they have eaten! We must not waste food”, he taught while his two kids & the other people present there nodded in unison & approval. Seeing their faces I could gauge that the little ones would sincerely try implementing the lesson from the very next meal onwards! I give the credit to my Papa, who always eats with relish and without a fuss, expressing gratitude for whatever is served to him & doesn’t waste even a morsel. From him I learnt- Actions speak louder than words. Also, I was amazed how he religiously set Maths Question-Papers for us every Sunday so that we learnt while we solved every kind of Question & understood the concepts. His funda- “Study for Knowledge, not for Marks”! Satyameva Jayate, Honesty & Integrity, Discipline, Dedication, Hardwork, Punctuality, Kindness, Respect, Goodness…all these have always figured in our Parents’ conversations with us. My Papa always quotes Mr.Azim Premji, with whom he has had the good fortune of working at Wipro in Mumbai. My Parents have always shared inspiring stories of action-heroes and heroines- personalities from Real-life, History & Mythology. My Mom says, “There will always be situations when life presents us two roads- one easy, the other difficult. The easy road will be easy to take, but it will be wrong or unethical. However, the difficult road will be tough, but it will be the right path. May you always select the correct road.” I was surprised to find Raj, ShahRukh Khan’s character, mouthing the same dialogue in the Hindi film Dilwale Dulhaniya Le Jayenge when the heroine’s mother asks him to run away with her daughter! As per my Parents, sincere efforts pay off & I can achieve anything that I set my heart and mind. I learnt they were right when I fulfilled my dream to win the Super Brain Super Personality Contest organized by Competition Success Review magazine. Paulo Coelho’s The Alchemist reiterates this as- ‘the Universe conspires’. 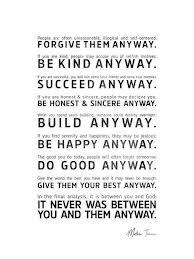 My Papa is a strong believer & proponent of Dr. Kent’s ‘ANYWAY’ poem, a favorite of Mother Teresa. Both my Parents uphold the same motto- “Do good anyway”, “Be honest and Frank anyway”…Being truthful has its fair share of memories! On the last day of School, one of our strictest teachers had just asked a question that none dared to answer. “What change would you like to see in me?” Everyone knew what change we wanted in her, but no one had the courage to express. Just when I was thinking whether to share the same & how she’d react if I actually did, you won’t believe what happened! She actually invited me to do so- “Anita, You tell me!” I said, “Ma’am, we would like you to smile a lot more everyday!” The whole class cheered and we got to see Ma’am’s smile for the first time ever! I admired her candid query & her quest to better herself & also the immediate implementation of the suggestion! I don’t know what prompted Ma’am to pick only me out of the whole class…Had she discovered that my friends used to call me ‘Raja Harischandra’ & ‘Yudhisthir’ in School? Whatever it is, she had the ability to choose the right person! I reflect on this incident with great pride that my reputation has always reeked of honesty! People confide in me and everyone feels they can trust me with the right judgement and that they value my honest opinions. I was a kid when my Mom and I had gone to the market. After shopping, we were nearing our home when my Mom spotted that I was holding a bright pink rubber-band that had two red plastic cherries! On realizing that I had unknowingly indulged in shop-lifting, she explained it was stealing & how wrong it was on my part to take something without asking for her permission or paying the shopkeeper. We both actually walked all the way back to the shop that night just to return the stolen item. As I apologized and handed over the colourful rubber-band, this lesson spread its colours on my life. Today, Shopkeepers look at me disbelievingly when I return the extra amounts that they have mistakenly handed over to me! It has earned me everyone’s admiration, respect and trust. As per George MacDonald, "To be trusted is a greater compliment than being loved." I don’t fish for compliments, yet have a great unenviable catch! I owe my Parents this…A BIG THANKYOU! My Parents have been great Parents and have earned accolades for their children’s behavior & achievements. However, I questioned my Parenting skills yesterday when my kid & I went to watch the Hindi movie Bhaag Milkha Bhaag (BMB) in a posh mall’s Multiplex. When Milkha Singh earns his first International event Gold Medal, we hear our National Anthem’s tune as the background-music. It continues to play as the Flying Sikh earns a lot many medals. I stood up out of respect; I have learnt that it is an insult to our National Anthem if we remain seated while it plays. In that almost House-Full Movie-Hall, I was the only person who was standing for those few minutes. Seeing me, my kid did not stand up, rather she asked me to sit down. After the music stopped and I sat down, she enquired why I had stood up. My terse explanation- National Anthem! After the movie was over, I gave a longer explanation that we must stand up whenever it’s playing, no matter where we are, irrespective of our location or situation. I asked her, “But, why didn’t you stand up seeing me?” She said, “If I’d have stood up, it’d have inconvenienced the persons behind me as they couldn’t have seen the screen. That’s why I asked you to sit down as you were blocking their view! You only have taught me empathy and to keep others ‘views’ in mind and not to disturb others! Also, no one else was standing up!” I taught her to always keep in mind that our Country is most important- our feelings for India must be above individual(s). When the time comes or need arises, we must unflinchingly sacrifice even self or loved ones for the sake of our country as ‘Janani Janmabhoomischa Swargatapi Gareeyasi’ (Mother & Motherland are greater than even Heaven). After watching the film, she had to attend a Birthday Party. After I left my kid at her friend’s house, I contemplated the incident. Had I failed as a parent that my kid did not trust me enough to blindly follow me? Did she not feel that I am always right and that if I have stood up, I’m standing up for what I believe? My kid is a student of Delhi Public School & belongs to the ‘Agni House’, the motto of which is boldly embroidered in white on her red T-shirt- “Fight For What You Believe.” Is my kid following this? The voice in my head was supportive. It argued in favour of my kid! My kid has a mind of her own. In the Cinema-Hall, she did not ape me or feel forced to give me company or to support me. I have always encouraged her to apply her mind and decide the best course of action. She acted within the realms of her knowledge and understanding. Then, of course, she is aware- ‘As in Rome, do as the Romans’. Are we afraid to stand out and be different? Is that why we have so few leaders? Is the crowd-behaviour of Indians setting a good example for our kids? Can we teach or impose Patriotism? Had most people stood up in the Hall while the National Anthem played, those seated would also realize and stand up to be a part of the majority. We would have set a practical example and a lifetime’s lesson for our kids there and then. Again, if our education-system had trained our kids well enough, they would have ensured that their parents did not insult our National Anthem while it played! I reasoned that parents can’t possibly teach everything to their kids; the outside world & the kid’s perception & grasping also has a role to play. In the Hindi film, Ferrari Ki Sawaari, there’s a dialogue- “Jo Dekha, Wo Seekha” (What we saw, that we learnt or Learning by Observing) Leading by example, practicing what we preach- We’ll learn from observation & practical experience all that life wishes to teach. My kid is so small and still has a lifetime to learn and unlearn and earn the crown of wisdom & experience. 'Learning For Life' shares some of what 'I Saw, I Learnt' - the right things that I have learnt from people, places and situations around me. Please do share your views on what you think about this. People want to do good but through others. Now-a-days its more of an embarrassment to them. Ask a parent to tell their children to be priests or soldiers & you will see tensed wrinkles on parent's foreheads. REASON - I don't want to sacrifice my child for something good, let others do it. Chalta hai attitude & puffy raged hearts are omnipresent in every part of India. Plastics were banned but ON they came again. Shopkeepers write "We will not provide plastics" & you get parcels wrapped with plastic. Does anyone think - OK - Let me carry a jute bag & do my part. Problem is this generation has an attitude & doesn't care. Everyone feels I am right & I am the boss of my own. No one tells me what to do. But in that all that stands out is goodness through people like Anita who engrave values into their young seeds who will prosper to be great & responsible citizens of India. Rare to find but please remain exceptional that you are. Do good & don't worry of the world. Met her on twitter & seen happiness in every tweet its because the goodness & purity prevails in her heart & in her family. Good bless you for this wonderful post ! Alfred, so nice of U to say sch kind words...Yes my sis Anita is a gem & so is Adisri...I'm grateful to God for givin them to me so I can also keep learning to be good and grounded frm them. Our parents hav always taught us the best things in the world. Do n be good to all even if U get nothin in return- not even do ppl realise your goodness, let alone a word of praise. That's y U Alfred are a rare exception- who can recognise the purest and good even in the virtual world. Actually, in reality, lies have pervaded lives so mch. Ppl often leave U & don't support U when they get 2 know dat hw upright and 'sinfully' honest U are. Even businesses sell with lies and evasions. Dishonesty has become a virtue- fake it to keep relationships,businesses n lives going. Today we Indians are not jst at an economic, political n social low- worst of all, we r at a MORAL low. Thanks Amrita for sharing your honest views. Actually, our parents have ensured that we always do! There is more to Moral Science Lessons at School...practical use of the lessons should do our Society a lot of good! Grateful to you & Alfred for such kind words! It takes goodness to recognize goodness! May the 'Goodness chain reaction' take over the whole world & may our GQ- Goodness Quotient increase! Thanks for your kind words! Deeply touched & overwhelmed! You have mentioned valid points. Shopkeepers are surprised when I carry cloth-bags for Shopping! Again, the same point- had our education & values system been strong enough, we would never have allowed this! Kids would have checked their Parents & vice-versa! People would have done the policing themselves about carrying the bags while venturing shopping! Pretty funny when we find people proudly demanding plastic bags at the market, as if it's their birthright! If we see someone with a fresh new plastic bag from the Shopkeeper or walking on the Street with bagfuls of veggies & grocery, how about feeling free to tell them what's the right thing to do! Change begins with us! Luckily, most Malls & Supermarkets are charging extra for Plastic Bags now. But, people are rich enough to afford extra 'branded' bags that 'up' their Style & Status!!! Always happy to find conscientious & morally-sound citizens! May your tribe increase!